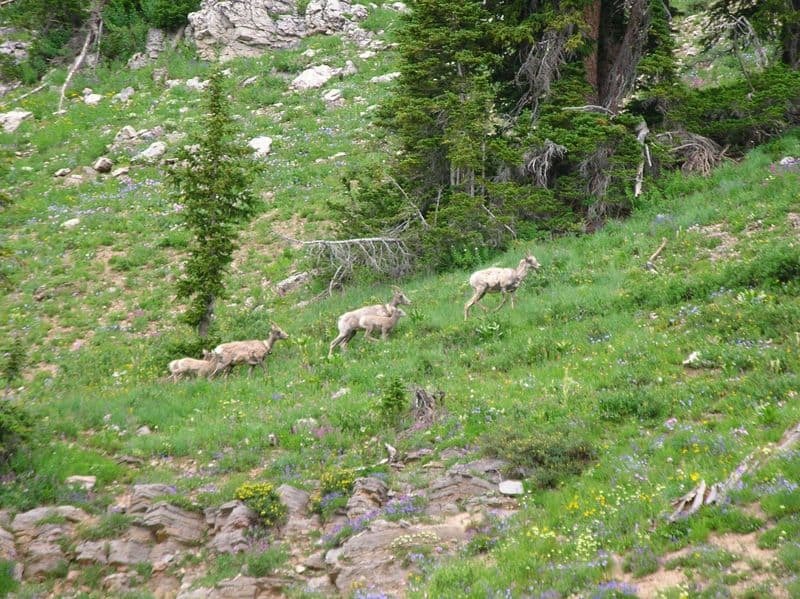 A recent study of an isolated bighorn sheep herd in Wyoming’s Teton Range has revealed new insights on how ungulates cope with the loss of migration routes, and how backcountry recreation encroaches on their remaining habitat. The bighorn sheep population in the Tetons stands at roughly 125, as it has since the 1980s. While biologists say the herd is in no immediate threat of a devastating die-off, the small numbers raise concerns about the herd’s long-term viability. The new information gives wildlife managers a better understanding of the adaptive abilities of bighorn sheep. 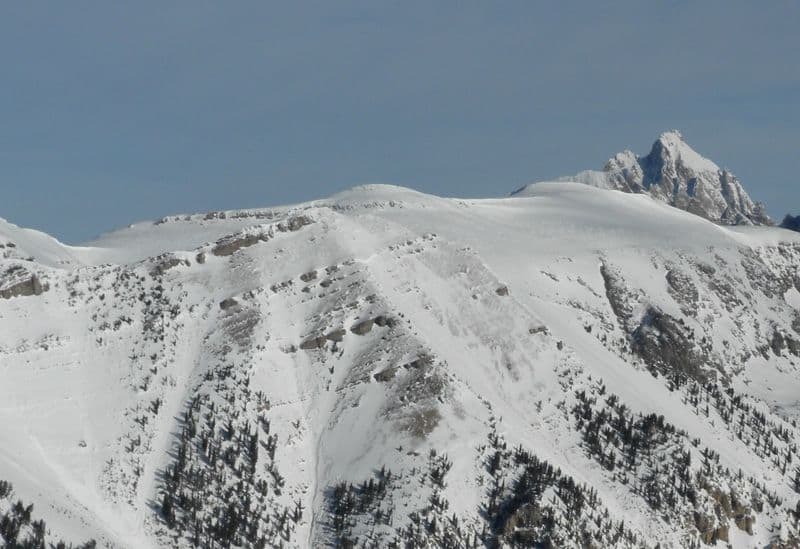 It will also inform future discussions of whether to enlarge current winter closures that prevent skier incursions into remaining sheep habitat. Wyoming Game & Fish biologist Alyson Courtemanch completed the GPS collar study during her graduate research at the University of Wyoming. 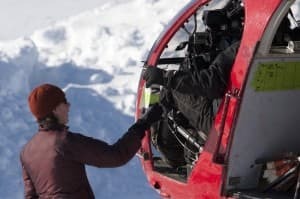 Her research documents how the Teton herd of bighorn sheep has evolved a unique strategy of wintering at extremely high elevations — above 10,000 feet. 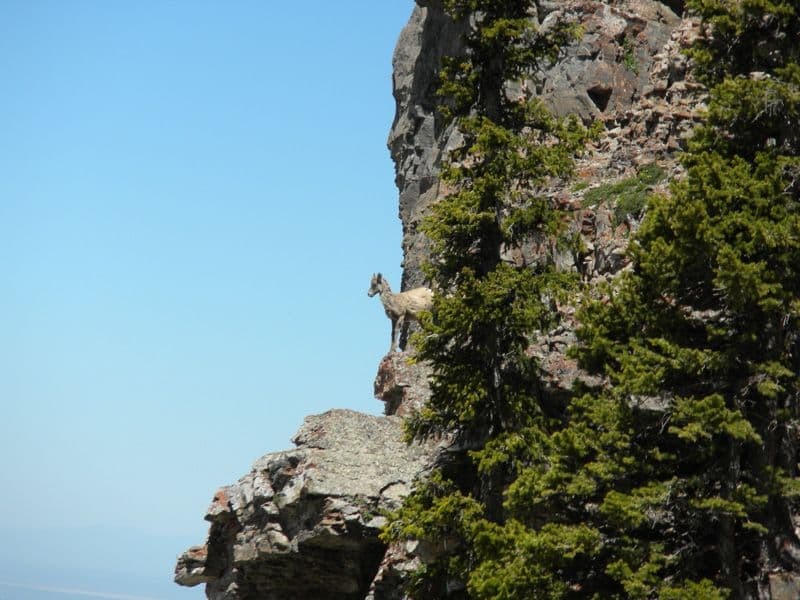 Rather than drop down with the first snows each autumn, as other bighorn sheep herds do, the sheep climb higher. The bighorn sheep survive the harsh months of December through March by seeking out patches of rocky, windblown ground high in the Tetons, when skiers at nearby Jackson Hole Mountain Resort frolic in the 500 inches of snow that fall each winter. As skiers cut runs and eat burgers at the Couloir Restaurant, the sheep eke out a living by grazing meager sprigs of grass and even pine needles, burning off their fat stores and, importantly, avoiding the deep powder the Tetons are known for. 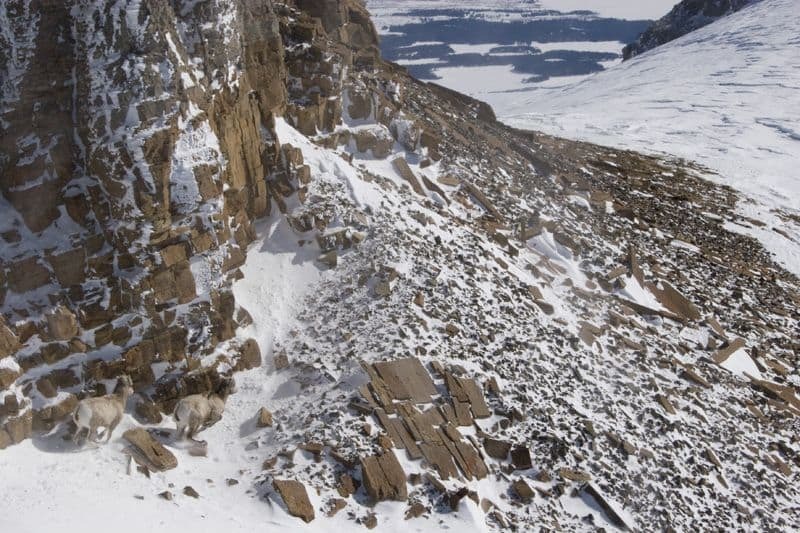 However, the Teton snows and the increasing popularity of backcountry snow sports have conspired to force the bighorn sheep off much of the winter habitat that would otherwise be available to them. 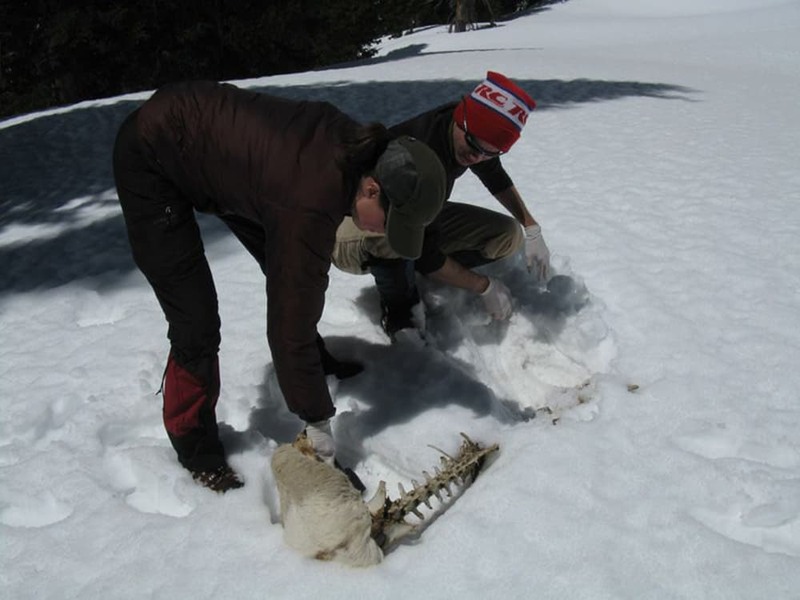 GPS data collected by Courtemanch during winters 2008 through 2010 suggests that skiers in high alpine areas cause bighorns to avoid choice habitat, and stay more active, which uses up their energy reserves. Even one skier a week can be enough to drive the sheep off choice locations and onto less ideal habitat. To those used to seeing bighorn sheep grazing along hiking trails or on the roadside, such skittishness from skiers seems unusual. Courtemanch and others explain that sheep can habituate to predictable movements of people and cars. After being captured by helicopter crews, released sheep may run just 30 meters away before stopping to graze while keeping an eye on the humans. However, the high speed and unpredictable routes of descending skiers often triggers a strong flight response among wintering sheep, perhaps by resembling a predator attack. If a group of skiers crests a ridge and drops into the viewshed of wintering sheep, the herd is likely to avoid the area entirely. That puts increasing pressure on this isolated herd perched high in the crown of the Tetons, in the last refuge it can find. Even though the herd’s population is stable and not in decline, the sheep’s long-term prospects are not favorable without an increase in habitat. Biologists say the Teton herd’s small numbers of 75 in a southern group and 50 in a separate northern group put the sheep at increasing risk of inbreeding and epidemic die-offs. The Teton sheep herd’s pattern of moving up in winter and down in spring is contrary to previously documented ungulate migrations. Across western Wyoming, mule deer, pronghorn, and elk migrate out of the mountains when the first fall snowstorm dumps more than a few inches of snow on the ground. Such seasonal movements often offer hunters their best shot at big game. In spring these same animals migrate up from lower elevation, following the green-up of highly nutritious forbs and grasses from the valley floor to alpine peaks. Crucially, the amount of time animals spend eating green forage drives their summer weight gain, and determines how well they will survive the coming winter. In contrast to other ungulates, the Teton bighorn sheep winter high, and in spring they make what Courtemanch calls an “abbreviated migration.” They drop down over consolidated snowfields until they reach green forage appearing at the edge of melting snow banks. Throughout spring, they work their way up to higher ground, following the line of green grass, until they are back at the same elevations they wintered, and higher. Courtemanch found that each fall the sheep make a second small downward movement to eat the last leftovers of forage before snow covers it. When that window passes in November and December, the sheep climb back up to their wind-scoured sanctuary of ridges and cliffs to wait out the hungry winter months. During harsh weather, they fold their legs under their bodies, minimizing movement and conserving body heat. Biologist Whitfield described the animals’ behavior as a state of “torpor.” When the weather is more hospitable, the sheep move from patch to patch of dry ground, covering a mile or two as they graze this little bits of grass that remain. The bighorn sheep’s behavior is a new adaptation that arose after the 1950s when human development — mostly housing, roads, and fences — cut the herd off from its traditional winter range on the buttes and valley floor of Jackson Hole. Whitfield established this fact by scouring historic documents and interviewing old-timers, allowing him to sketch out the extent of the Teton herd’s range over the 20th century. Olaus Murie, the famed naturalist from Moose, Wyoming, saw bighorn sheep trying to cross the highway near his hometown in 1952 to head up to the Tetons. Since then, there have been only occasional springtime sitings of bighorns trying unsuccessfully to cross the valley to summer range in the Tetons. Conversely, sheep aren’t coming off the Tetons to lower elevation winter range each fall. By abandoning the valley floor, the sheep have cut themselves off from neighboring herds. That has kept them free of pneumonia bacteria that cause periodic die-offs among the Jackson herd of bighorns, which summer in the Gros Ventre Mountains that abut the east side of Jackson Hole. However, the Teton herd’s freedom from infected herds comes at the cost of growing more genetically isolated. A concurrent study by Grand Teton National Park and the University of Montana shows that the Teton herd’s southern and northern groups don’t mingle with each other during breeding season. 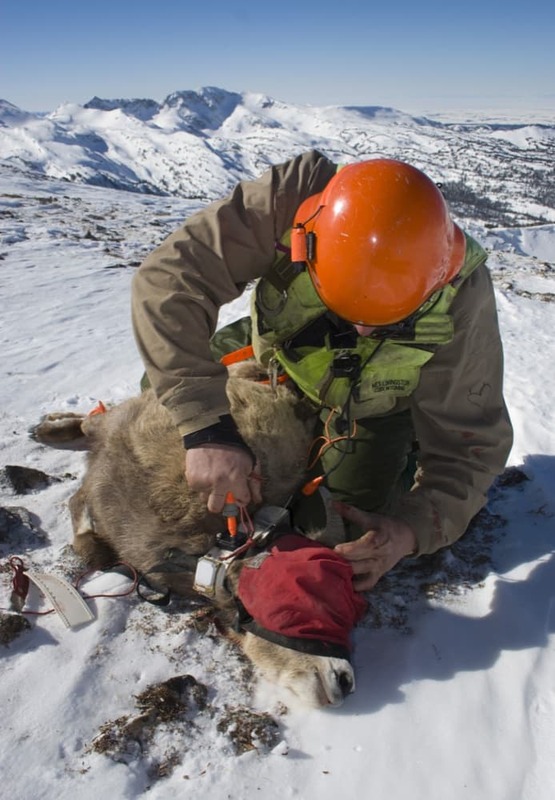 Study authors Martin Kardos and Gordon Luikhart of the University of Montana showed through genetic analysis that the Teton sheep have been cut off with the neighboring Jackson/Gros Ventre herd for several generations. That means the herd’s resistance to disease will drop as it becomes more homogenous. “We actually have two really small herds, so that even puts them a little more on the edge of a quick die-off,” said Steve Kilpatrick, a former Wyoming Game & Fish biologist who now heads the Wyoming Wildlife Federation. While the high-elevation habits of the Teton herd help keep it away from traditional disease vectors like horseflies and other insects, Kilpatrick said the herd would have a low resistance to an outbreak of pneumonia or other disease. For now, the sheep remain in remarkably good condition. The helicopter crews hired to capture and collar the sheep in February and March 2008 said the sheep were in remarkably good shape given the harshness of their winter range. They weren’t scrawny, or sick, and they had thick coats of fur. Over the past century, the Teton sheep have survived a multitude of serious threats, including hunting pressure from humans. The same awe-inspiring rock climbing skills that keep bighorns clear from grizzlies, eagles, and wolves also helped them avoid extirpation by hunters. The regulation of hunting on National Forest and National Park land also benefited the animals. Livestock grazing in the early 1900s left the Tetons overgrazed and prone to erosion, to such a degree that dust clouds made by domestic sheep could be seen for miles, Whitfield said. The wild sheep moved more freely then, and found other forage. In the early 2000s, the Bridger-Teton National Forest and the Wyoming Chapter of the Wild Sheep Foundation took action to eliminate the threat of disease spreading from domestic sheep into the Teton sheep herd. They did so by buying up domestic sheep grazing allotments on the west side of the Tetons from willing sellers. Many of the Idaho-based sheep ranchers stayed in business, moving their grazing allotments farther west to the Big Hole Mountains. This opened up additional mid-elevation summer range for the Teton bighorn herd. However, the herd has slowly moved into new habitat because of their lifelong loyalty to the home ranges they were weaned on. 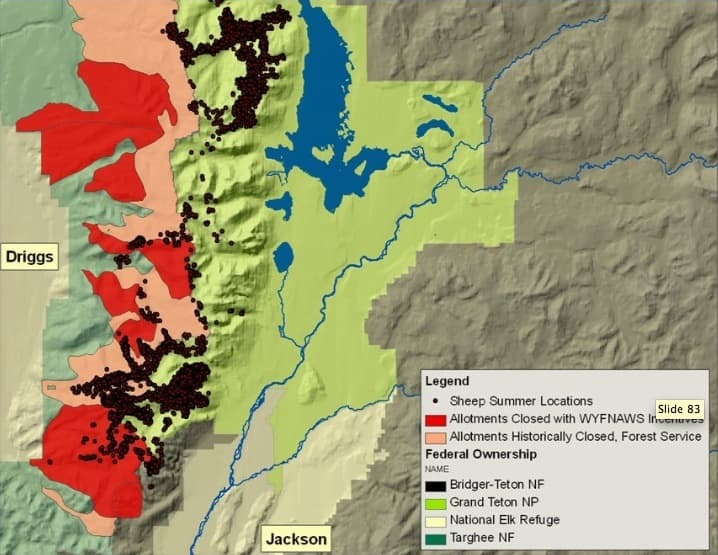 The Game & Fish considered transplanting bighorns from the Jackson/Gros Ventre herd onto the newly opened range in the early 2000s, but decided against it when they learned the source herd was in the midst of an epidemic die-off, Kilpatrick said. At present the bighorns’ only major threats are avalanches, and winter die-offs through disturbance, exposure, or starvation. In the mid 2000s biologists from the Game & Fish, Grand Teton National Park, and the Bridger Teton National Forest wanted to know how backcountry recreation affected the sheep. That brought about Courtemanch’s in-depth study of sheep winter range, seasonal movements, and a comparison with backcountry ski routes. Starting in the late 1980s, Grand Teton National Park staff closed a ski route that disturbed bighorn sheep winter range. 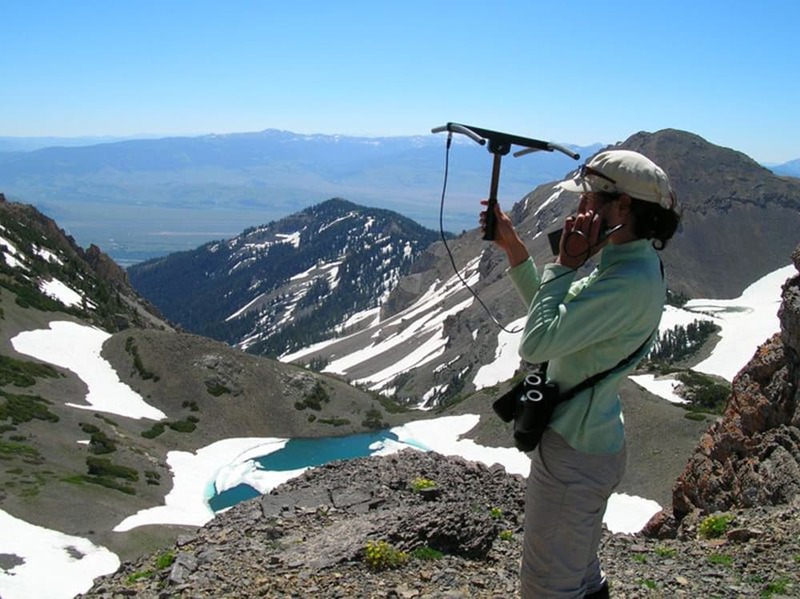 A subsequent Very High Frequency (VHF) radio collar study in the mid-1990s by GTNP biologists Steve Cain and Mason Reed led to additional seasonal closures of ski routes in the national park. While the closures on Static Peak and Prospectors Mountain frustrated some local skiers at first, most have now accepted them because there are so many other places to ski. GTNP public relations officer Jackie Skaggs says those who break the closures usually don’t know they exist, or don’t know where they are in relation to the closure. 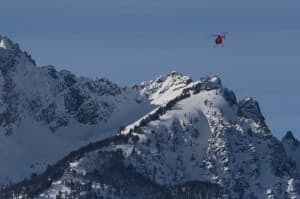 The closed areas aren’t marked on the ground, but skiers learn about them through a public relations campaign called “don’t poach the powder,” with maps posted on websites for the Jackson Hole Conservation Alliance and the Teton Avalanche Center. The park occasionally investigates violations uncovered by observing ski tracks on closed faces, or through social media postings of skiers’ exploits. 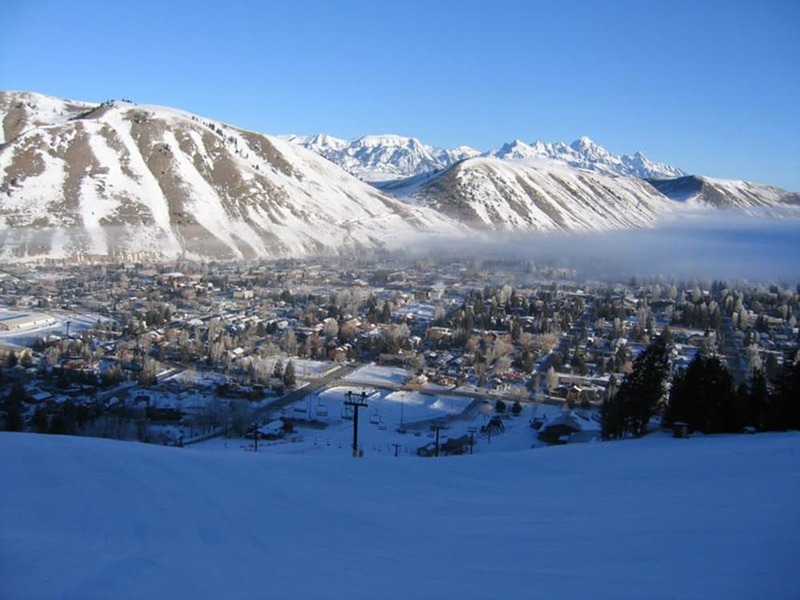 Skiing in a closure is punishable by a fine of up to $5,000, with a mandatory court appearance. 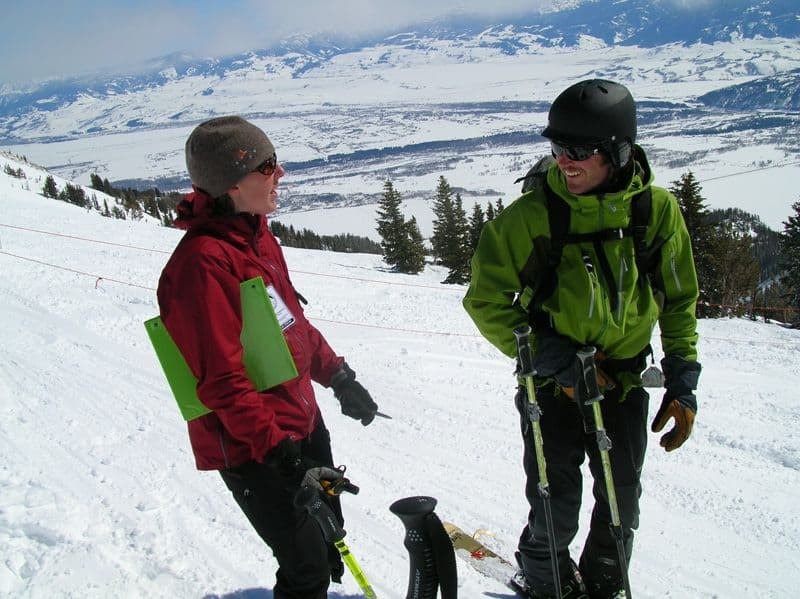 Jackson resident Reed Finlay has skied mountains on all sides of Jackson Hole since the early 1990s. Now a ski patroller with the Jackson Hole Mountain Resort, he says most skiers recognize the importance of the closures and have a respect for the sheep. GTNP biologist Sarah Dewey, who worked closely with Courtemanch during the study, said the research confirms that existing closures have largely succeeded in protecting sheep habitat in Grand Teton National Park. 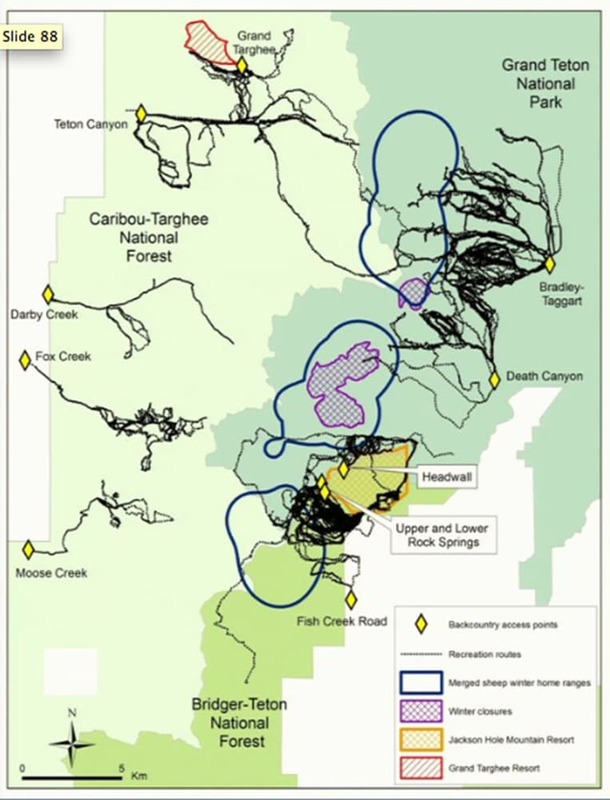 The study identified further areas of the Tetons that sheep could be using in winter, but are avoiding. Courtemanch collected data on skier routes by asking some 800 backcountry users to voluntarily wear a GPS device for the day. 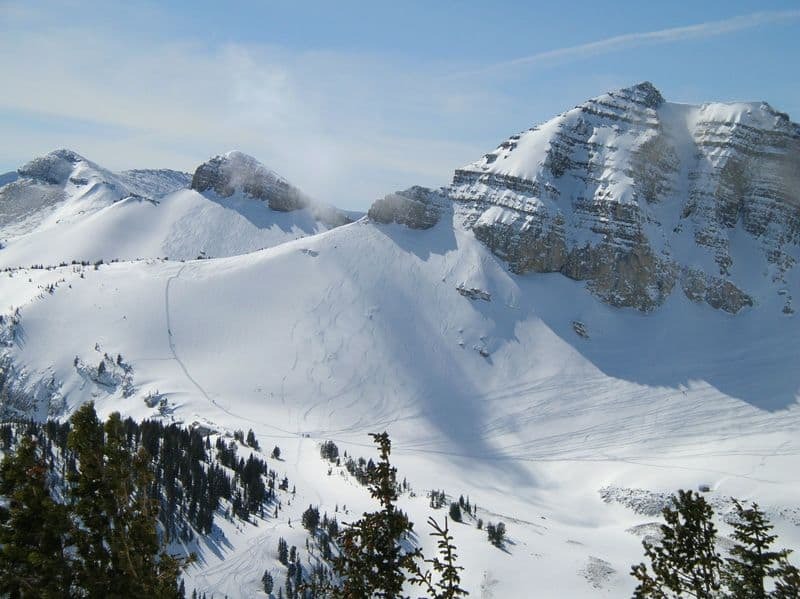 Many of the skiers who enter sheep winter range originate at just a few popular trailheads and at Jackson Hole Mountain Resort. 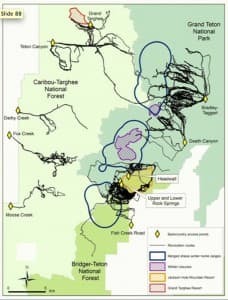 When she mapped the skier data with the sheep data, the results suggested disturbance from skiers causes sheep to avoid a significant amount of otherwise ideal winter range. It’s possible further winter closures on Bridger Teton National Forest could help take pressure off the sheep, though managers haven’t considered any yet. 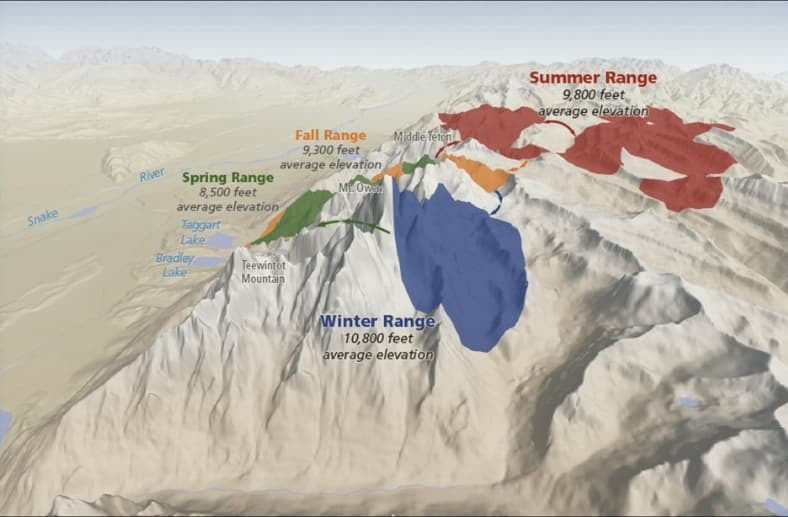 Kilpatrick pointed to Jensen Canyon as one area of possible discussion, where restricting travel to a single corridor could allow skiers to unobtrusively pass through sheep winter range. 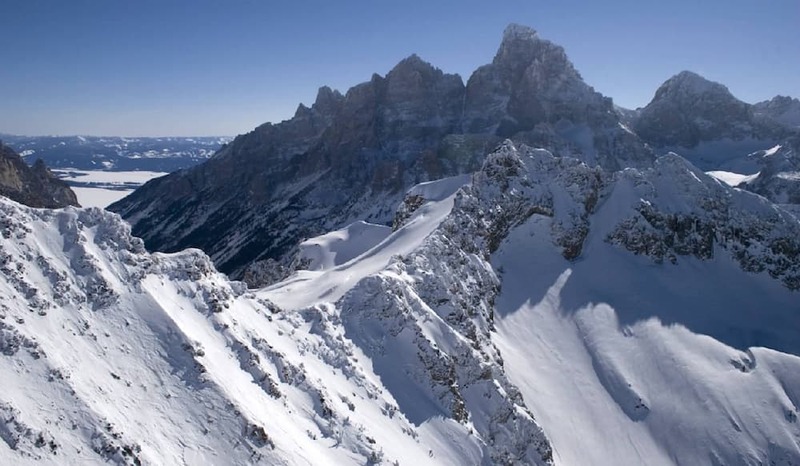 Importantly, any future closures would not affect the vast majority of skiers, while leaving many other places to ski in the Tetons from December through March. The closed areas would remain open to late spring skiing in April and May. “We have disease taken care of,” Kilpatrick said. “The next topic is habitat. 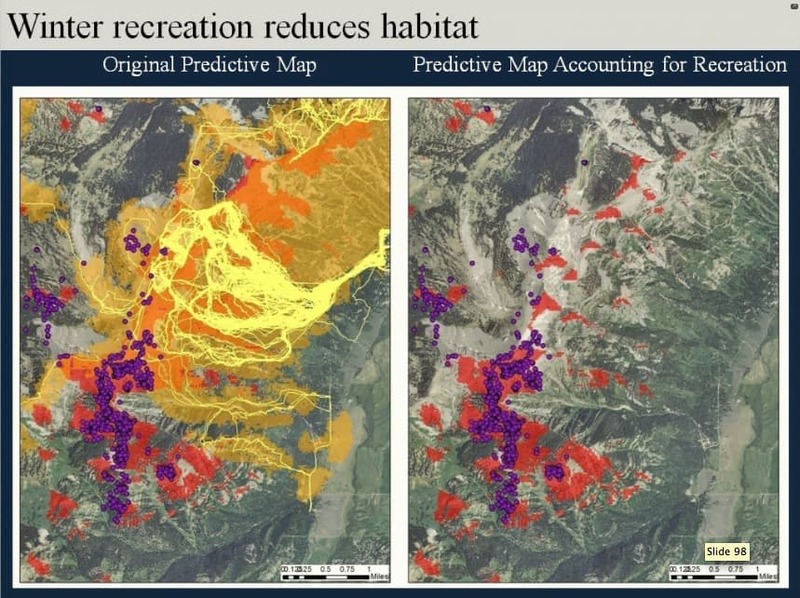 Let’s start with working with the backcountry users, and provide a little more habitat by restricting use.” In addition, Kilpatrick said managers could use wild and prescribed fire to improve low elevation summer habitat on the west side of the Tetons. Further discussion of management of the Teton sheep will wait until this fall, to give time for Courtemanch’s study to make it through the academic peer-review process. 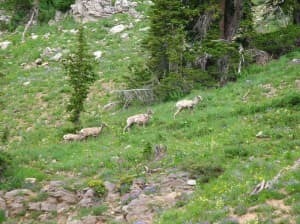 At that point the inter-agency Bighorn Sheep Working Group will meet to discuss the study and any potential policy changes on National Forest land. Any further closures would be considered in a public comment process, said Dale Dieter, district ranger with the Bridger-Teton National Forest. While it remains to be seen what actions will be taken to preserve the sheep, it’s clear no one wants to see the herd decline or disappear. Click here to learn about current winter closures in Grand Teton National Park and neighboring National Forests. 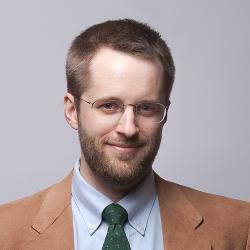 Click here to learn more about Courtemanch’s research and the Kauffman lab. The 2010 annual report for the study is here. Wyoming Governor’s Big Game License Coalition, Wyoming Chapter of the Wild Sheep Foundation, Wyoming Game & Fish Department, Grand Teton National Park – Rocky Mountain Ecosystems Studies Unit, Teton Conservation District, Grand Teton National Park Foundation, Bridger-Teton and Caribou-Targhee National Forests, Greater Yellowstone Coordinating Committee, National Park Service – University of Wyoming AMK Ranch, Eastern Chapter of the Wild Sheep Foundation. Greg just read your article on the Teton sheep herd as a follow up to the current article on the legislatures actions this session with wild sheep. Informative and great writing. Wild sheep are my passion and I appreciate the reasoned coverage of there issues.